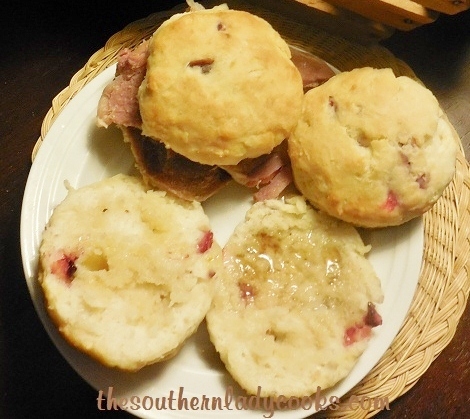 Sourdough biscuits are wonderful for breakfast or any meal. Slather them with butter and honey for a treat your family will love. These sourdough biscuits are great. My family loves them and having sourdough starter on hand, you will always have something to make. They are just as good left over and reheated in the oven or microwave after several days. If you like the taste of sourdough bread, you will love these biscuits, too. Mix the above ingredients together. Don’t pour melted butter in while still hot, let cool to warm. Cover with saran wrap but leave opening on sides so batter can breathe. Let sit overnight. Mix the above dry ingredients and add to wet mixture from night before. Add enough flour that you can get it onto a well floured surface and knead but leave it a little sticky inside. Roll to 1/2 inch thick, cut out and place on a greased baking sheet. This makes about 20 large biscuits. Bake at 400 degrees 18 to 20 minutes.These are wonderful leftover and put in microwave for 20 seconds with butter and honey or I use them in my recipe for bread pudding. Recipe for sourdough starter. Enjoy! If you love Sourdough bread, you are going to love these biscuits. Bake at 400 degrees 18 to 20 minutes. Don’t forget to pin Sourdough Biscuits. Feel free to “share” with your friends by clicking on the Facebook, Twitter or Pinterest buttons below. You can print by clicking on the green printer icon above and below each post on this site. Can you freeze the leftover biscuits? I have not tried freezing them, Judy, but I see no reason why you couldn’t. I freeze regular biscuits all the time with no problem. Hi, we have been making the bread and cinnamon rolls with great success. We made biscuits today, and they seem a little heavy, and dry. Not as fluffy as your photo, any suggestions please. Just don’t over knead the biscuits. Maybe, you need to add more liquid, too. Hope this helps. I am reading that once combined the biscuit rests and rises overnight. I am concerned that since milk is in the batter that it is not safe, am I reading correctly or is it safe? Thanks, I have two bowls rising now and thinking I just might make some biscuits! That’s the way I do it and have never had any problems. Thanks so much! So the biscuits don’t need a second rise? Merry Christmas, your recipe has been my best gift yet! Some years my starter never took off, this year my loaves are rising over the rims beautifully! No, they don’t Wanda, and happy you are enjoying the recipes. Thank you for the wonderful sourdough recipes. I have had the same starter for 26 years and have shared it many times. I usually just make loaves of bread or cinnamon rolls. I am very anxious to try some of your recipes. I knew I loved you. I have been looking for a sourdough starter and easy bread recipe. I think I have found it. I can’t wait to try it. I also love your quotes and jokes on Facebook.